It is time for the rudder so the aft fuse deck, vertical stab and stringers can be completed. The plans include a sheet with the rudder bow referenced to a grid. I marked a sheet of Fokker paper with 2" grid lines and used the plans to plot the curve of the bow. A drywall square works great for laying out the grid. I numbered the grid lines like you did in high-school math to make it easier to avoid mistakes. 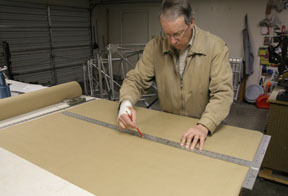 The remainder of the dimensions were drawn on the paper and blocks added to locate the rudder spar. 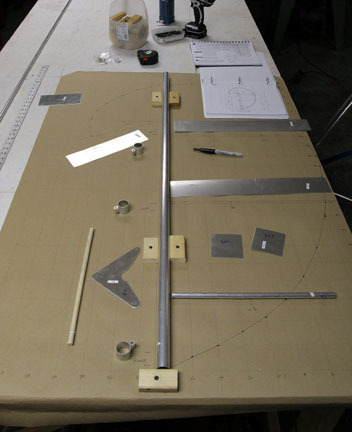 Shown are the rudder components laid out in their approximate locations. 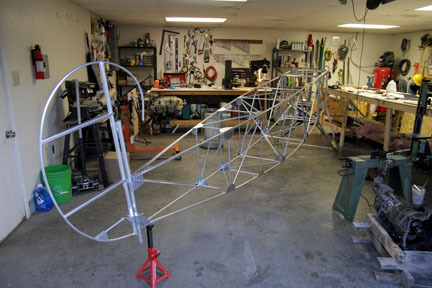 Most of the fabrication will be bending the bow and forming the sheet ribs on the metal brake. The rest is pretty basic assembly. 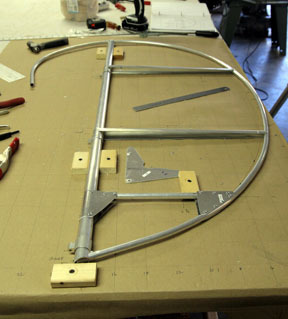 Here is the rudder taking shape. 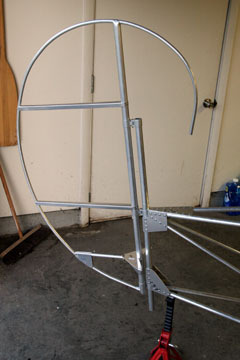 The bow was bent using a 14" diameter bending form. It was bent a tiny amount, moved 1/2", bent a tiny amount again, etc, etc until it matched the pattern on the grid. 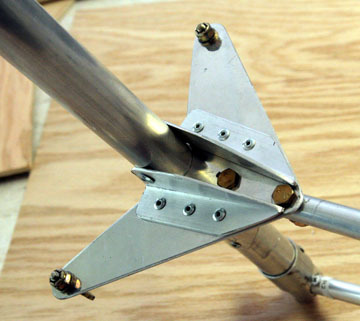 The free end of the bow needs refinement, that will occur when the rudder is matched to the vertical stab. First fit-up on the fuse. The tailpost was just temporarily set in place. Ready for vertical stab and completion of the rudder.